A blow-up is the term used to describe a print made by enlarging, or “blowing-up”, smaller formats, usually those on 35mm film, but 70mm prints have also been derived from 16mm and even 8mm originals. I was born in the same year as CinemaScope had it’s public birthday. Went to school and began during school work as a part time projectionist in Aachen, Elysee cinema. The obvious solution is to use large format 70mm film with its 3X times the resolution of standard film. With 70mm, less magnification is required and the improved quality is noticeable at once. It will be a high-impact experience for most people, unlike anything they have seen previously. Once they become aware of the WOW factor, ie. 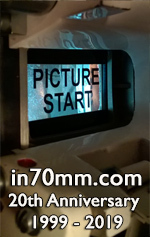 big, bright and sharp images, they will prioritize 70mm presentations. The audience will perceive any film in 70mm to be far more intense on the subconscious level because the brain has three to four times more picture information to "process" per second. New concepts in relation to screen design for 70mm, 35mm and D-Cinema. When I finally met him after thirteen years, I felt almost speechless with admiration. By Rick Mitchell Who is Rick Mitchell? By Thomas Hauerslev "Keepers of the Frame"
I was in college in the mid 80's and I heard that Universal was trying to get rid of their old Sensurround equipment. A small seminar, where students and professional got together to enjoy large format films. Issue 10 of Cinema Retro has just hit the streets. This issue features 64 pages about the glorious 1960s cinema. Special interviews with Richard Johnson, Luciana Paluzzi, Elke Sommer and David McCallum. Go back to a vintage decade and re-experience rare posters and stills.